Sqn Ldr Dharmendra Shankhwar was born on 14 May 1982 at Ramgarh Cantt Jharkhand. After initial schooling from Sri GNP School Ramgarh, he did his BSc. 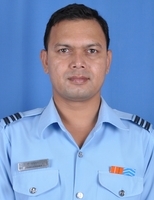 in Computer Application from Ranchi University and was commissioned in the Logistics Branch of Indian Air Force in Dec 2005. The Officer has served in various locations of the country which started with Leh as Flying Officer. At Leh he got opportunity to command Kargil detachment for winters, during freezing temperatures between -10 to -30 Deg Celsius. He has served in five different establishments in IAF, which includes one flying base with extreme weather conditions, a Base Repair Depot, a Radar Unit, an Equipment Depot and a Training Unit. He has mostly served as a logistics officer handling provisioning, procurement warehousing, distribution, disposal and system administrator of IMMOLS. As an instructor, he has carried out professional training of ab-initio trainees of Logistics branch. Sqn Ldr Dharmendra Shankhwar is also a sports enthusiast. He has some marathons in his accomplishment; he plays football, likes swimming, cycling, long distance bike riding and Cricket. He is also an amateur archer and golfer. He has been commended on 26 Jan 17 by the AOC-in-C Training Command IAF for his performance as instructor. He is married to Mrs Mamta Shankhwar who has served as journalist. The Shankhwars have a daughter and a son. The daughter is studying in class XI and the son is studying in class III.